I've made a very quick card, using products from Crafter's Companion. What a fun stamp set this is! or what occasion it will be for, so a sentiment will be added to the inside later. Thanks so much for stopping by! Hope you liked this one! 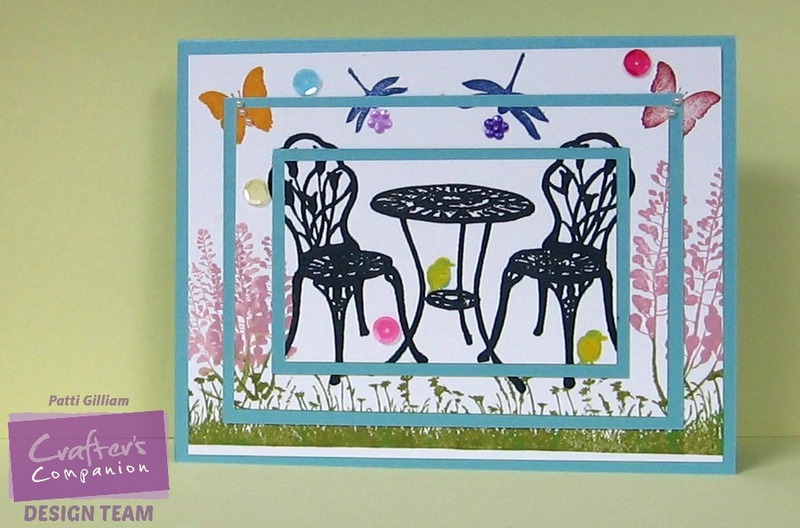 What a stunning card Patti, it can be used for so many different occassions too, great to have ready to go! Gorgeous! LOVING the table and chairs!!!!!!! 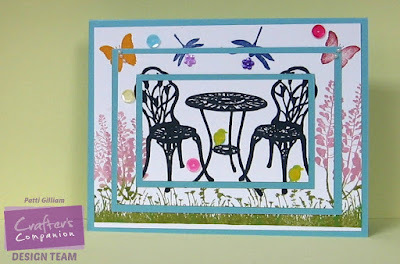 What a fun card - love the table and chair stamp you used and then you created a pretty scene. CU soon!!!! Oh my gosh, I love it. This is one of my favourite style of cards and you truly blow me away with the cuteness. Those chairs are gorgeous. I love it. A fabulous card design. Very sweet card, Patti. Love the card design. You created such a serene spring scene. Love it! Beautiful card, Patti. I always love this layered look. It adds such a professional look to any card.